We now move away from the majestic and distant Romanesque virgins that we saw in the first galleries of the museum, and turn toward the Gothic era in which Mary is represented as a woman and mother. This excellently crafted piece shows Mary leaning slightly to the right to compensate for the weight of her son. Jesus sits atop his mother's forearm and holds a small bird in his hands. In the Gothic tradition, mother and child are represented in a more natural, tender style-quite different from the rigid Romanesque style, in which the mother merely serves as her son's throne. Here, a loving relationship is evident in the smiling faces of both. This sculpture is attributed to sculptor and silversmith Pere Moragues. A native of Barcelona, he was one of the most highly esteemed artists of the Gothic era within the Crown of Aragon. Worked between 1355 and 1360, this is one of the earliest pieces created by the artist during his professional career. It comes from Cervera, where it originally sat in the church of the Convent of Sant Francesc de Paula. A special mention must be made of the stone used for this sculpture-alabaster. 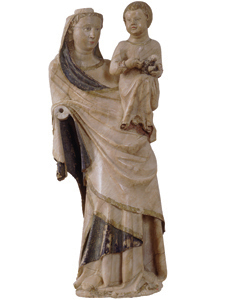 This malleable and easily worked material was a favorite of Catalan sculptors during the 14th and 15th centuries. They took full advantage of its light tones and chromatic elements. As this sculpture was restored, the loss of its original crown was revealed. It was apparently replaced by a metal crown, which has been lost as well. Frederic Marès bought this work from Barcelona collector Soler i March along with the sepulcher by the Ferrán González workshop which we saw in Hall 12.